What I love most is hosting friends and family in my home. I take pride in providing a comfortable, relaxing room for them to feel like they are ‘home away from home’. With an increasing focus on the beautiful and eclectic interiors of Airbnb homes, there’s a growing trend for creating the perfect guest room in your own home. The fun part about decorating a guest room is that you can be as creative as you want, taking inspiration from your local area and travels. Today we’re going to share some simple steps you can use to decorate a guest room and transform it into an inviting haven for your guests. 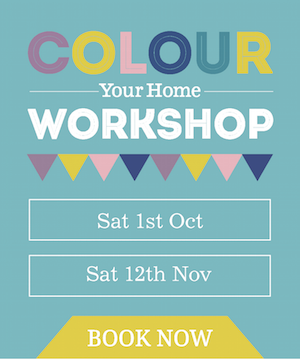 Take inspiration from nature and handmade artisans in your local area. Shop around for unique ceramics and art to create a simple and relaxed look for your guest room. Handmade furniture and neutral linens add warmth and create a cosy retreat for your guests to sleep in. Using local products adds character to the room and makes it a more interesting space. It will also inspire your guests to shop at local stores and galleries in your home town, so they too can leave with their own treasures. 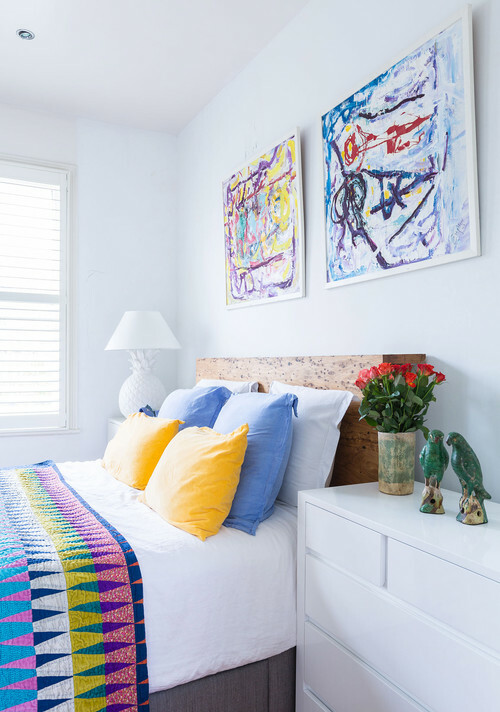 If you struggle to know where to start choosing a colourful palette for your guest room, pick a signature piece such as a bold piece of artwork or a bright patterned quilt and work from there to build layers of colour and texture for your perfect guest room. The owners of this cute South Melbourne home below, have picked a gorgeous patterned throw as their focal point, and paired it with selected pieces of art and soft furnishings to tie the look together, without it being over the top. I love the warmth added in the timber bedhead to tone down the crisp whites and bright colour to create a homely feel. The bed is the main statement piece in your room. The key to a comfortable bed is a good mattress and layers of soft linen and pillows. When making up your guest bed, first tuck a flat sheet over your fitted sheet, then add your duvet or quilt, and finish off with a textured throw on top. You can never have too many pillows or cushions in my mind, but they still need to be styled in a way to invite your guests to relax and feel cosy. Natural linens and faux fur throws are a big trend this winter so splash out and make your guests feel special. 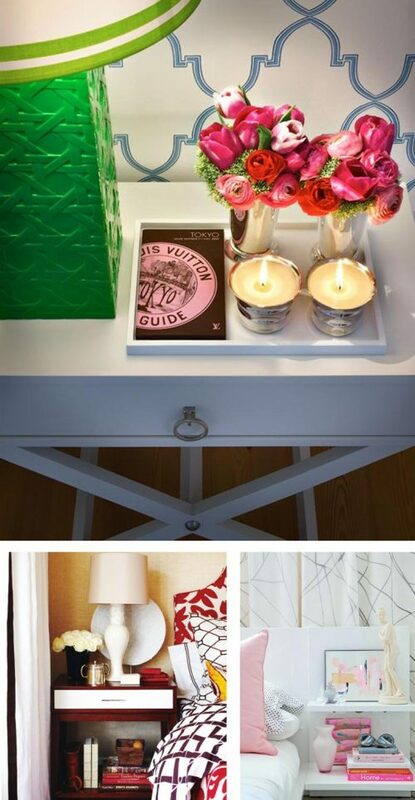 Inject your personality into your guest room by decorating the bedside table with a few of your favourite things. Keep in mind your guest will be using the table as well, so stick to a few key pieces. 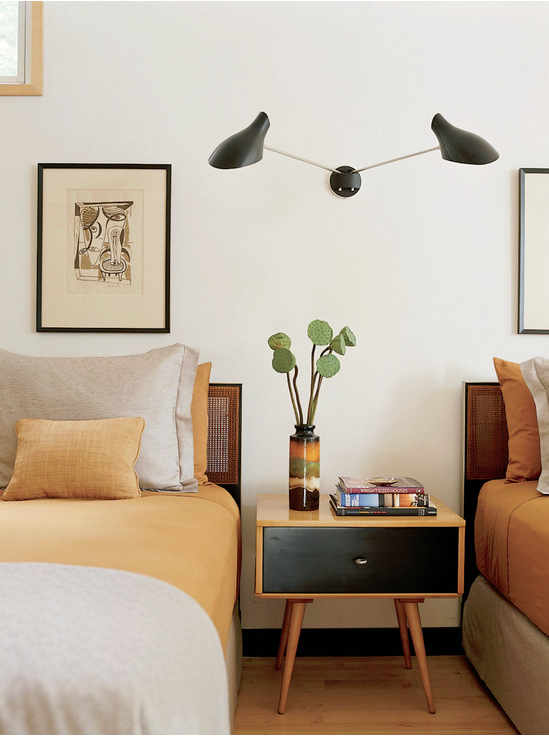 It is essential to have a lamp, whether it is hanging from the wall or on the table, and it would be ideal for the bedside table to have drawers. Keep it simple with some fresh flowers, a candle and your favourite book; or be creative and add some art and unique pieces you may have picked up at the flea market or during your travels. The most important thing to think about when you decorate a guest room is comfort: if you were staying in this room, would you be comfortable? Don’t overlook details such as mood lighting, storage and unexpected treats to make your guests feel welcome. If you are worried that your guest room doesn’t have the right vibe, my advise would be to test it out for the night and see how you it stands on all comfort levels. You will then know what changes to make in order to maximise the feel of your guest bedroom.